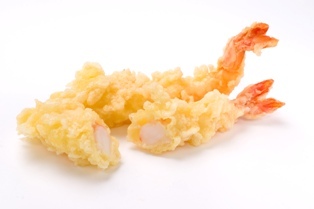 Ebi no Tempura ('エビのてんぷら', is classified into deep-fried dish), is known as Shrimp Tempura in English, and 天妇罗炸虾 (Tiān fù luō zhà xiā) in Chinese. It is the washoku. Japanese: Ebi Ten, Ebi no Agemono. Egg, Tempura Flour, Oil, Shrimp.